You know it’s hot when your dog willingly foregoes his morning walk to get back inside the air conditioning. The Mister and I adopted a dog on Friday. I must preface this entire conversation with one well-known fact: I am an animal lover and a sucker for a stray. I have had two cats for a long time now (one just turned 7, the other will be 6 at the end of the month). I’ve always wanted a dog, but have never had the time. Now that we’re married and getting a home, now is a good time. Or at least, as good a time as any. 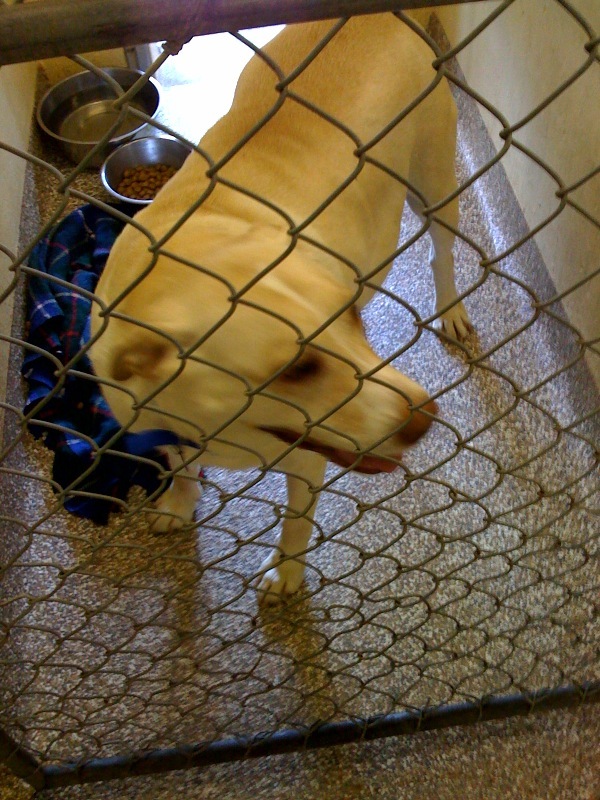 So to continue…I get an e-mail from The Mister at about 1:30 on Friday afternoon with a picture of a dog in what is obviously a shelter kennel and the following caption “I can take home?” In fact, I don’t think you get the visual, so here’s the picture. And it was almost as hot Friday as it is today. So I call The Mister, told him to hold his horses until I get home and I’ll even leave early so we can go see the dog. I know, without saying anything, that as of that moment we already adopted the dog. So we did. We spoiled him this weekend with new toys and treats and leashes and collars and visits with humans and dogs alike. The cats aren’t thrilled, but they are standing their ground and Rocky (that’s what renamed him) doesn’t try and attack them–just play sometimes. Spencer, my oldest cat, is beginning to try and inform Rocky that he is boss, just as he did when Lucy came into my home so many years ago. Ahhh…the circle of life. Here’s the fun part: we don’t close on the house for a little over a week and we don’t move in until the end of the month. So for now we’re in a townhouse apartment with very little livable space with three animals–one of whom takes up a lot of space. It’s like I’m running my own zoo or something. The dog has been good for me in a lot of ways. I don’t dilly dally getting home from somewhere. I have taken more walks in the past few days than I have in the past few months combined. I am concientious about the time and affection given to the cats (so that they won’t be disgruntled) instead of just taking them for granted. The Mister is just in love. Rocky is not without his issues. He is out of shape and he can only do about a mile walk right now. His joints are creeky and so we’re getting him on glucosomine to help. He may or may not have some allergy issues. Upon discovering this stuff The Mister got concerned that I’d want to take him back. I accused him of not knowing me that well–I’ve never once considered getting rid of my Lucy because of her health issues. Why would I start now? All in all, we’re starting a four-legged family. The best part is that the dog appreciates everything we do. It’s like getting pet on the head is the equivalent of winning an Oscar to him. I told him he needs to teach the cats a few things about grattitude (not that they’d listen). It’s such a thrill being able to take in an animal in need. You get this superhero-high for a good week or so. So even though it’s hot, I won’t complain (too much) about taking a dog out. The reward is greater than the investment.